Each time a player draws cards because of a card effect, he/she takes 500 points of damage during the End Phase for each card drawn by the card effect. We start off the depressing, depressing week after the holiday with Greed, a Trap from Soul of the Duelist. Greed is a Continuous Trap, meaning it's very vulnerable to S/T removal but also meaning if you play it correctly, you ll get to use its effect more than once. It's a mixed blessing. Greed has a very interesting effect. Whenever a player draws because of a card effect, he takes 500 extra damage for EACH card drawn. What does this mean? Chain Greed to your opponent's Pot of Greed and he'll take 1000 damage. Play Card Destruction when your hand is small and your opponent's large and he'll probably end up taking 2000+. Of course, there is a price you take damage when you draw as well. This is, however, simple enough to avoid. Don't activate Greed if you plan on drawing a lot; instead, run Greed only in Decks that force your opponent to draw a lot. Run Sasuke Samurai #3, Card Destruction, and so forth your opponent will be hurting. Effect: Some relate the effect of Greed to that of Null and Void. However they are incorrect; it isn’t that bad. Whenever somebody draws a card through a card effect, they lose 500 Life Points for each drawn card. Simple right? All your opponent needs to do is activate a Pot of Greed and they lose 1000 Life Points. The downside to Greed though is that it’s a Continuous Trap Card, making it vulnerable to cards like Dust Tornado and Mystical Space Typhoon. Another downside is that it applies to the owner of Greed as well, so you’ll need to be cautious when using your own Pot of Greed. A final downside is that there isn’t a great deal of widely played drawing cards. I’d say there are about 15 different drawing cards in your average Regionals. But with all that aside, Greed can have a pretty nice effect. Effect – Adequate. Combos: Greed combos best with cards that force your opponent to draw, but not you. The Bistro Butcher, Sasuke Samurai #3, and Hiro's Shadow Scout all do this. Of course, you could use Morphing Jar and Card Destruction, but that could come back to haunt you later in the duel. Usability: Greed could be used in a standard Burn Deck, but the odds it would do a lot aren’t high. Greed would work best in a Deck Mix of Burn and Deck Out, forcing your opponent to draw cards until they can draw no more and lose the duel as a result. Greed is a card that shouldn’t be your first choice in a Burn Deck, but may increase in usability at a later date. Advanced Format: 1.5/5. Good effect but not enough uses. Traditional Format: 1.5/5. Good effect but not enough uses. Coin Flip Greed... This is one of the more annoying cards from Soul of Duelist, especially for those who have pulled like twenty of them. I myself have pulled two, and wish I had three, so I can't say I know their feelings, unless you count my 96734 Hallowed Life Barriers. I digress... We must get on with the review. 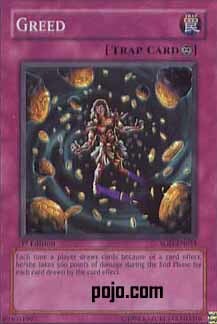 So, who here can tell me what the maximum amount of realistic damage in one turn is involving this card? That's right! 5500 damage! Most people consider cards that make their opponent draw pure garbage for that exact reason. You can't have your opponent drawing cards. It just doesn't work. But what if you inflict massive amounts of damage to them in the process and then null the cards they drew the next turn? That's right, a Greed burn. If you thought Sasuke Samurai #3 sucked, you are pretty much on the spot unless one of two situations is met. One involves Chaos Emperor Dragon, and the other this. The realistic 5500 damage is this. Attack your opponent when they have, say, 3 cards in their hand. Then, in Main Phase 2, activate Disturbance Strategy. End phase, they take 500 x 4 and 500 x 7 for both card effects. In lieu of that, you can activate Card Destruction or Morphing Jar's effect or whatever. And then, after they draw in their Draw Phase, activate another Disturbance Strategy and then Heavy Slump for another 5500. The Greed deck requires 4 or so cards to win, any one of which can be easily substituted for the other, save Greed and Sasuke Samurai #3. Once Deck Destruction Virus of Death and Deck Destruction Virus of Magic/Demon come out, though, you're looking at discarding monsters that they draw by Sasuke Samurai's effect. Since they have to draw UNTIL they reach a certain number of cards, you might get 2-4 more cards from them before you reshuffle their hand with Heavy Slump or Disturbance Strategy. With Makyura out, this can be done on the first turn with a bit of removal and a Painful Choice. For double the trouble, use it with Secret Barrel or Restructor Revolution (it has some use!). I don't like to rate cards that are useless outside of their own deck, so I will give you no rating for today. The average deck will want to draw cards for themselves, and thus you will probably hurt yourself if you play this outside of its own deck. Greed is a very interesting card, one that can add scads of damage quickly but also backfire and hurt you, the user. To maximize it’s effectiveness, you’ll want to build a deck around its powers, using cards that force your opponent to draw, thereby damaging him. Unfortunately, the flaw with such a strategy rears its ugly head upon closer analysis. There are numerous cards in the game that will hurt both players, including Card Destruction and Morphing Jar. So the proper way to utilize Greed is to mix it up with cards that force your opponent to draw, including Disturbance Strategy, The Bistro Butcher, and Hiro’s Shadow Scout. Does a deck focusing on such combos work? Advantage F/H: This is a card I really can’t recommend, even for burn decks. My reasoning is simple; there are many commonly played cards in the game that will hurt both of you, including Card Destruction and Morphing Jar. Realistically, you’re going to have to use some absurd card like the aforementioned to do damage to your opponent; the problem is that effects that give your opponent cards to draw will help him. In essence, you’re trading 500 life points for increased strategy and resources, which is never a good plan to pursue. Best Draw for the Situation: When a card offers zero advantage by being used, I can’t recommend it to be drawn in any situation. If your opponent likes to burn his own life points out, this might be a good combo with Sasuke Samurai #3 or Disturbance Strategy to finish him off; 3000 damage can be quite hefty. Attributes/Effect: The damage portion of this card can really add up, leading to scores of anywhere from 1000-3000 depending on the cards you use in conjunction. But do the math, each of those life point damage totals equals the same amount of options for your opponent, anywhere from 2 more cards to 6! Dependability: In a deck with enough stall elements, you might be able to set up intricate combos allowing you to attack directly with weaklings like SS #3, or pound them with the 1800 Bistro Butcher. In the real duelist world, however, such pipe dreams never pan out, and often you’ll have a hand full of useless cards that cannot function with Greed, the only “draw” punisher of its kind. The Bottom Line: Sorry, Greed, but you don’t quite cut it. Cards it functions well with: Disturbance Strategy, Hiro’s Shadow Scout, The Bistro Butcher, Card Destruction, Morphing Jar, Sasuke Samurai #3…. Sorry for the lateness here -- with all the controversy of last week's Thanksgiving CotD (actually, only one person began the complaints, you know who you are), I had forgotten about this week's CotDs. Greed's an interesting little trap. Basically, anytime anyone draws, they lose 500 LP at the end of the turn they drew in, not counting stuff in the draw phase. Obviously, this card doesn't belong thrown into any deck -- it needs to be played in a deck where you force your opponent to draw. Obviously, the best deck for this is deck destruction -- 3 Sasuke Samurai #3 (I think that's the one that forces drawing of up to 7...), Card Destruction, and Morphing Jar, among other things. Needle Worms wouldn't help trigger Greed at all, but they'd allow the deck to flow. Greed wouldn't be the victory method of choice for the deck, but it'd allow for a second option. Combined with Magical Thorn (for those fortunate enough to get a hold of up to 3 of the TP5 Super Rare), it'd be quite a deck to beat -- Morphing Jar would do 2,500 to each (from Greed) and damage to the opponent from Magical Thorn. Quick win condition if pulled right.